National Burger Day is this Sunday, May 28th. 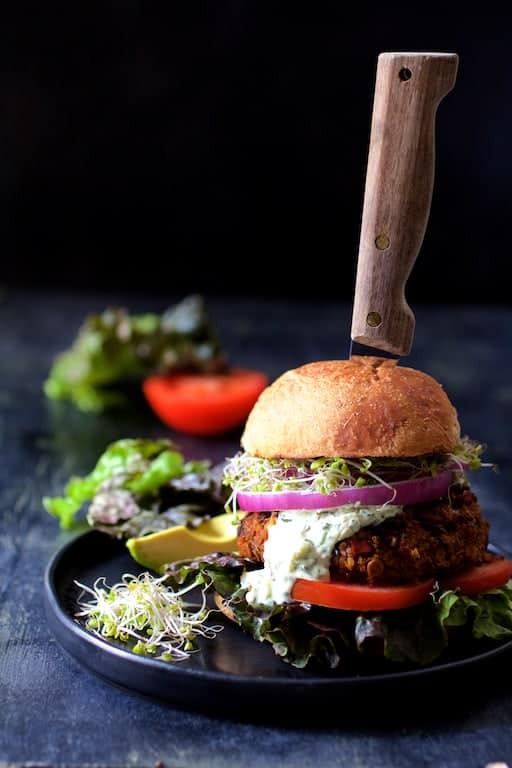 Lentil Walnut Veggie Burgers with Avocado Tzatziki Sauce are hearty enough for a carnivore! You may even need a knife! Move over meat! There’s a new burger in town! 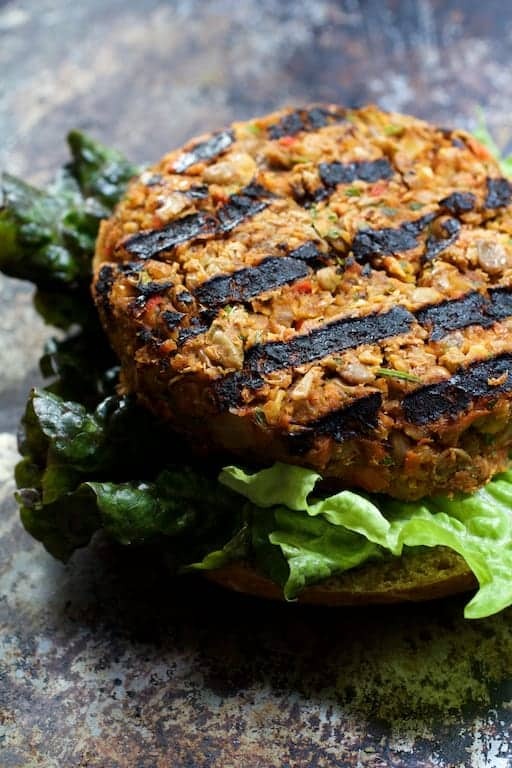 These spicy, Mediterranean-inspired Lentil Walnut Veggie Burgers make a healthful and satisfying meatless option for flame-kissed meals all summer long. 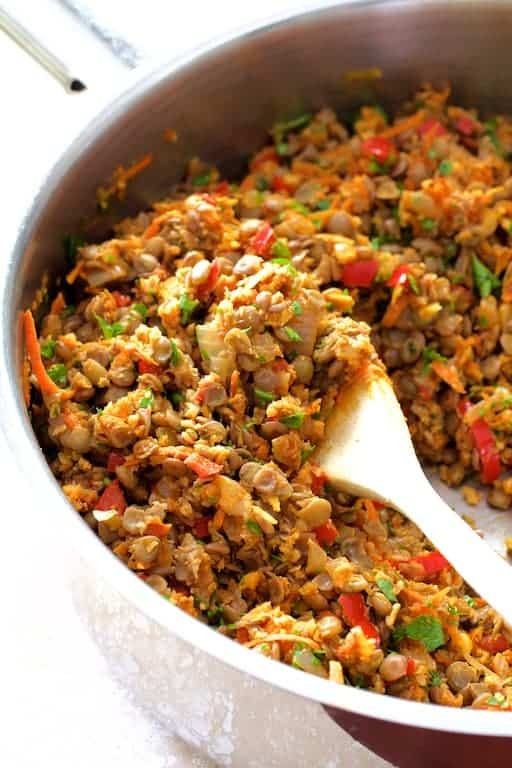 Brown lentils are packed with fiber, protein and iron along with lots of other great stuff. Walnuts add additional texture and contain healthful omega fatty acids. Can you say that about a beef burger? Before preparing any lentil dish, it’s a really good idea to look them over carefully for any debris. A white paper plate works perfectly for this process. Place some on the plate, spread them out to better examine them and remove any funky things you see such as stones, shriveled lentils or stem pieces. The paper plate makes it easy to then “funnel” the lentils into a sieve for a good rinse before cooking. If the lentils you’re using are older, they’re going to take longer to cook because they have lost moisture. Yes, even something like a dried lentil is going to still have some moisture in it. After everything is cooked and combined, I like to use an immersion blender to puree the lentil and vegetable mixture rather than place it in a food processor. The reason is I can better control how much to puree the mixture AND I don’t have to wash out my food processor before making the Avocado Tzatziki Sauce. Most homemade vegetarian burgers are rather fragile in an uncooked state. I’ve made these Lentil Walnut Veggie Burgers several times over the years and they can be done on a conventional outdoor grill. However, you’ll need a vegetable grill rack and you’ll need to be very careful handling them. Be sure to use indirect heat because of the nuts. Burned nuts are awful! I cheat a little bit to get the gorgeous grill marks you see here. I bake them first, then pop them onto a grill pan. And then this Avocado Tzatziki Sauce! 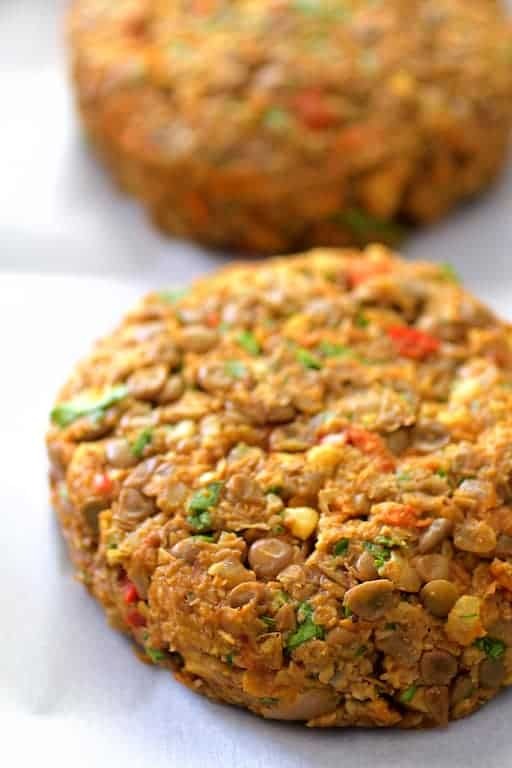 It’s so cool and refreshing with these spicy Lentil Walnut Veggie Burgers! Serve with fresh, crunchy lettuce, tomato, red onion, broccoli sprouts, more avocado and oh my! You’ll need a knife to eat this one! Enjoy and Happy National Burger Day! 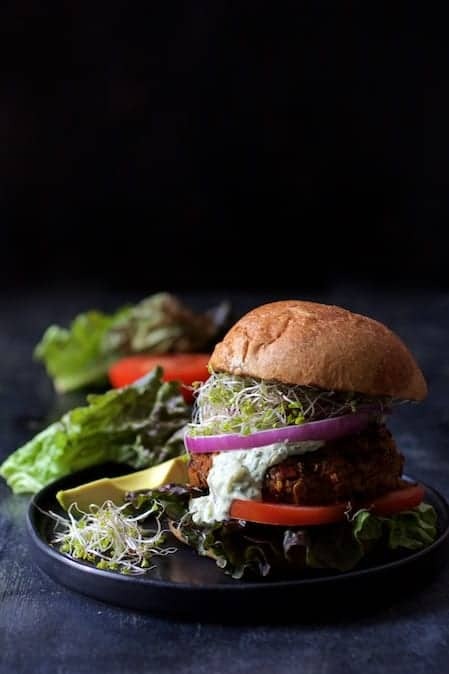 For more great veggie burger recipes, check out my latest Community Table Post – 10 Vegetarian Burgers Fit For a Carnivore! 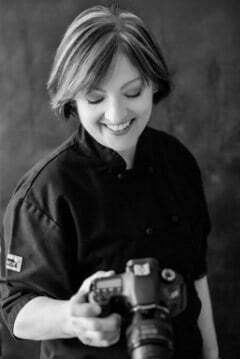 I’ve got lots more vegetarian meals so be sure to visit my special Vegetarian and Meatless Collection! 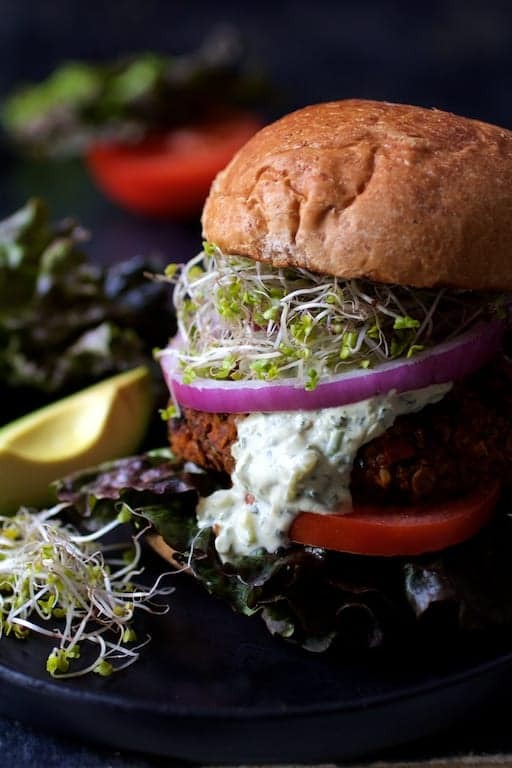 Lentil Walnut Veggie Burgers with Avocado Tzatziki Sauce are hearty enough for a carnivore! You may even need a knife! BURGERS: Preheat oven to 375 degrees. Bring a small pot of water to a boil. Add the lentils and cook 15-20 minutes or until very tender. (It's okay if they're falling apart slightly.) Drain well. Meanwhile, heat oil in a skillet or saute pan over medium-high heat. Add the onion, reduce heat to medium and cook 5-7 minutes or until beginning to soften. Add the carrots and red bell pepper and continue cooking another 5-7 minutes or until vegetables are tender. Stir in the garlic, cumin, coriander, smoked paprika and cayenne and cook 30 seconds or until garlic is fragrant. Add the drained lentils, walnuts, panko and parsley. Using an immersion blender, coarsely puree the mixture, leaving some of the lentils and vegetables whole. Form mixture into 6 patties and place on a parchment-lined baking sheet. Bake for 25-30 minutes. Spray a non-stick grill pan with cooking spray and heat over medium-high heat. Place the patties on the grill pan and grill 1-2 minutes per side. Serve on whole-grain hamburger buns with lettuce, tomato, red onion and tzatziki sauce. 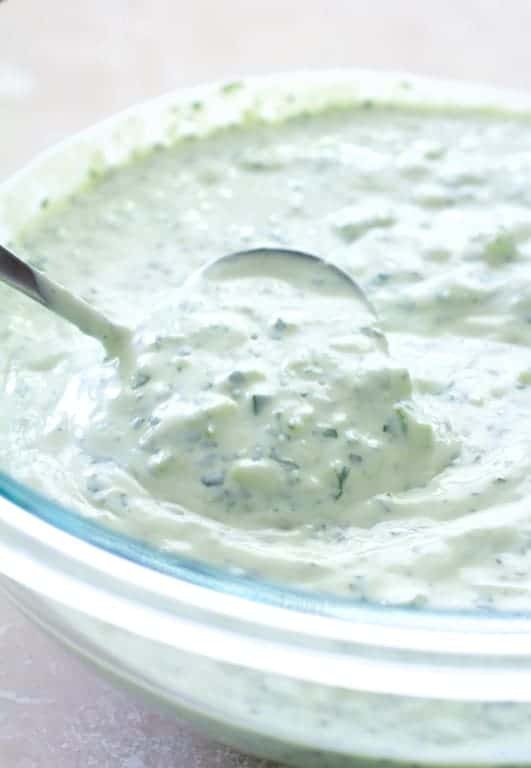 TZATZIKI: Combine yogurt, avocado, cilantro, garlic and lemon juice in a food processor. Process until smooth. Add the cucumber and pulse several times, but do not fully puree. This looks like a seriously tasty burger that I would get served to me at a pub. Just give me a beer and I am set! Thanks, Meg! Even my hubby enjoyed it! I’ve never had lentils in burger-form before. I’d love to try it out! 2. The burger patty sounds amazing. 3. I am on team “put sauce on everything!” and your avocado tzatziki looks divine.